Husky pressure washer units are remarkably popular in the United States. The brand Husky is trusted by many home owners and enjoys very good ratings. Pressure washers from Husky are mostly used in the home setting to carry out a variety of home cleaning projects. On this page we review different pressure washer machines from Husky. Selling for $99.00 this Husky pressure washer has an output of 1400 psi and a flow rate of 1.3 GPM. 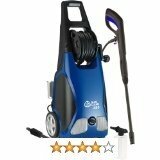 It is a cold water electric pressure washer designed to do certain less demanding cleaning jobs around the home. One of the key highlights about this pressure washer is its maintenance free pump. For any electric pressure washer, the pump is the most at risk of being damaged sooner than later. By including a pump that requires less maintenance Husky sought to preserve the life of the pump. This unit has a unique design allowing the main unit itself to clean the surfaces as it rolls along. The spray wand is connected to the unit and used to clean the surface leaving more than an inch wide circle of cleaned surface for every move. The design mimics steam carpet cleaners. Other specs to look forward to on this home pressure washer is a spray wand with 3 quick connect nozzles. It is certainly designed better than the European made Bosch pressure washer which at about the same pressure output does not allow quick connect nozzles in its design. This unit has a detergent tank onboard. This model enjoys extremely high positive ratings from most owners and users. At 1400 psi some parents have expressed comfort allowing younger children too use this machine to do cleaning jobs around the home. It is certainly unlike the gas powered pressure washers and some hot water washers which can be dangerous for teenage children to use. some out of the box technical failure has been reported to do with connectors, and motor failing to stop running, for example. This unit belongs to the Husky washer newer models. 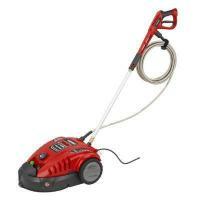 It is a 2009 electric cold water pressure washer model that runs on a 1600w universal motor. It has maximum output of 1400 psi at a flow rate of 1.6 GPM. This is enough power to perform certain household cleaning projects such as driveway, siding, bricks, walkway, grill, car, garage floor, deck and many other light household projects. In terms of reach of the power cord, expecrt a 25 foot long electric power cord GFCI certified. It has a 19 foot long high pressure washer hose. True to most electric power washer designs, this unit has no quick connect nozzles in consideration in its design. This means it is not possible to use a pressure washer turbo nozzle. It has a 0-60 degree fan spray nozzle for adjusting output. This Husky pressure washer unit has a very appealing sturdy design which is compact. It rests on two plastic wheels which also affords it a great deal of mobility. When choosing a pressure washer you might consider looking at the different washer outputs that we have reviewed within this site. These include 1500 psi pressure washers, 1600 psi pressure washers, 2500 psi pressure washers and 3000 psi pressure washers. There are also high end washers with output as high as 4000 psi. This is yet another 2009 model from Husky. It has power output of 1800 psi at 1.6GPM. This Husky pressure washer comes with a turbo nozzle designed to deal with the more challenging projects around the home. It is a quick get-going out of the box machine with almost no assembly required. In terms of its other specs, this washer comes with a non-marking high pressure hose of 30 feet long. Hoses on some pressure washers have the disadvantage of leaving marks on the surfaces whilst cleaning. This is typically the case when the hose is pulled to run across concrete, driveways or walkways, for example. A special material used in the construction of the hose such as in this case is effective in leaving no marks. 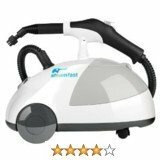 It has a 35 foot power cord which is long enough to clean most areas around the home without having to unplug. It has an onboard hose reel making it easy to store the hose as well as a spray wand which can be stored onboard. It comes with a detergent tank making it possible to apply detergent easily when dealing with bird droppings, for example, in your cleaning projects. It is a relief that this unit also has metal connectors. This helps in limiting leakages and breakages as is teh case with plastic connectors. Overall we recommend Husky products and all the products reviewed above. They are high quality and well made. If you are looking for something of a high pressure output, other good brands include Karcher washers, Campbell Hausfeld, dewalt washers and McCulloch pressure washers.